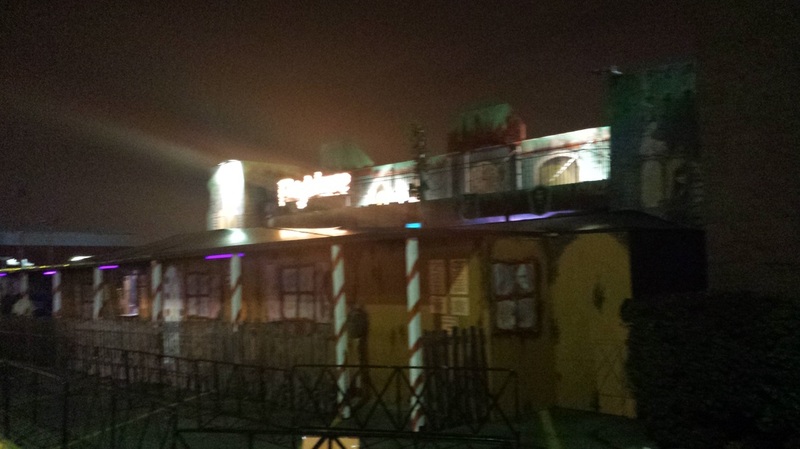 Frightmare is one of those trhowback haunts, of the kind one might have found at a carnival or state fair back in the 70's. It's in a prefabricated trailer type structure that has two levels, as well as inside and outside parts. In past years, Frightmare had a movie monster theme, and it featured some great scenes with Jason, Freddy, Mike Myers, Ghostface, Samara, Leatherface, and more. However, for the past couple of years, Frightmare has changed their theme. This year's theme was sort of a twisted nursery rhyme/fairy tale theme, and while it was decent, removing the movie monsters really kind of lowers the overall enjoyment factor for us. Given the the haunt layout is fixed, visitors tend to follow the same path each year, although the scenes change and are rearranged to a certain degree. Most of the haunt is decorated in colorful neon that glows, and if you had 3D glasses it would most likely be in 3D, although the haunt is not billed as such. Some of the scenes that stood out this year included a giant moving wolf dressed as Grandma that jumped from the bed while Little Red Riding Hood ran away, a royal castle filled with playing card actors including the Queen of Hearts, and a woman peering into a magic mirror out of which a demon appeared. Most of the actors are younger, and many of the scares consist of simple startles or jump outs, but there's still enough to see to provide some variety, as long as one enters knowing that the haunt will not be intense or terrifying. Quality does vary from year to year, though, and this year the quality was not the best. Some of the actors seemed bored and others were even out of character, just standing around with their masks off. While Frightmare used to be a "go to" haunt for us, after a couple of years of mediocre experiences, it's now on the "maybe" list for us. However, as mentioned, Frightmare does change the scenery each year, so there's always that possibility that the next year will be a good one.